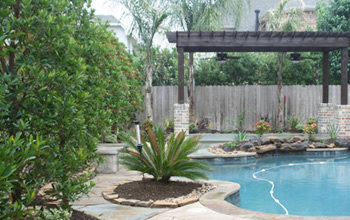 Cypress Lawn and Landscaping offers unsurprassed quality in residential and commercial landscaping in the Cypress area. Our professional team of landscaping experts can handle any need you have; whether creating your own backyard oasis, or developing green space for your tenants to enjoy outside of an office building, we can do it all. We work closely with our clients throughout the entire design and build process in an effort to ensure that the end result exceeds your expectations. Our team will walk you through each and every detail, and guide you through the challenges of your particular project, so that you do not have to sweat the small stuff. We can handle it all for you. Sit back and watch your dreams be built! 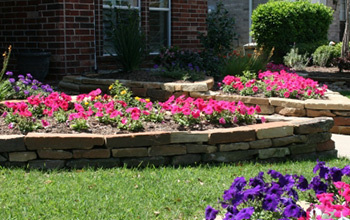 At Cypress Lawn & Landscaping, we handle all aspects of landscaping from design to installation. 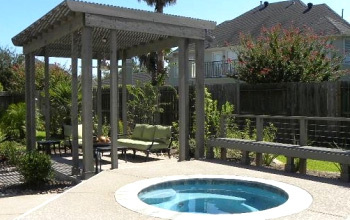 Whether you need lush greens around your pool area, or you are dreaming of curb appeal, we can build it for you. Let us help you design a space where you can create memories for years to come with customized lighting and details that make lasting impressions. Create a secondary living space to enjoy time with friends and family with the installation of an outdoor kitchen. Let us help you create a fire pit that will serve as a gathering space. Stop dragging a hose to water your lawn. Cypress Lawn & Landscaping can install a new sprinkler system, or repair your existing system. We are also skilled at creating solutions for land with poor drainage. Trees add much needed height and depth to any landscape design. Our team of experts is dedicated to caring for your trees to ensure they flourish within your landscaping for many years to come. The key to any great landscape is a healthy foundation. Your lawn serves as the starting point for designing and building a beautiful landscape. I had a tree get struck by lightning and fall over in my backyard, and I had a party planned to happen in 3 days. with a beautiful new tree, all in time for my party, It was a huge success! has done a phenomenal job for me, I couldn't be happier. professional to deal with. Thanks again!